Euclid Golf represents the work of Barton R. Deming, a real estate developer who brought together Cleveland’s leading architects and builders to create one of the finest, planned residential communities in the country. Barton Roy Deming was born in Windsor, Canada, August 21, 1875. His father, Hubert V. Deming, was originally from Watertown, New York, and had settled in Canada where he became involved in the mercantile and lumber business. Barton was the ninth of ten children. He was educated in Sarnia, Canada and graduated from its high school in 1892. In 1893 he followed several of his brothers to Cleveland, Ohio. In Cleveland, Deming first worked in the ordering department for the Mechanical Rubber Company and then as a bookkeeper for the Oglebay, Norton & Company. After spending two years in the West to improve his health, he rejoined his brothers in Cleveland and assisted them in organizing The Deming Brothers Company in 1903. Hubert V. Deming, Jr., the oldest brother, was president of the firm until 1908 when Barton took over. Grant W. Deming was the vice-president and manager, and Orville G. Deming was secretary. Barton R. Deming was treasurer. Cecil C. Deming, the youngest brother, was also involved. The reason for this announcement is unclear. Perhaps Barton Deming believed he needed to state this fact in order to secure his deal with Rockefeller or perhaps he just wanted to differentiate himself from his brother. Mr. Clarence E. Terrill, Manager of Rockefeller's Abeyton Realty Company, stated in a letter dated February 5, 1913, “Mr. [Barton] Deming would surely be a splendid chap to take hold of [the Euclid Golf property], while his brother Grant Deming is somewhat discredited, Mr. B. R. Deming stands high and has no connection in a business way with his brother Grant.” Grant Deming may have fallen into disfavor with Rockefeller when he fell behind on mortgage payments for the original Forest Hill Allotment. Nevertheless, Grant Deming did successfully meet his financial obligations and went on to develop many other properties in the Heights. Later Euclid Golf advertisements make no more mention of the issue. Barton R. Deming lived at 2485 Fairmount Boulevard, in Euclid Golf, from 1914 until the death of his wife, Helen, in March of 1934 and the marriage of his only daughter, Elaine Allen, to Weston Schmitt the same year. His nephew, Grant Deming, Jr., helped him auction off his furnishings and then lived with him in the Heights Rockefeller Building apartments on Mayfield Road and Lee Road in Cleveland Heights (National Register of Historic Places, 1986). Deming worked for John D. Rockefeller, Jr. on the development of his father’s Forest Hill estate into a residential village (Forest Hill is located in Cleveland Heights and East Cleveland; National Register Historic District, 1986). 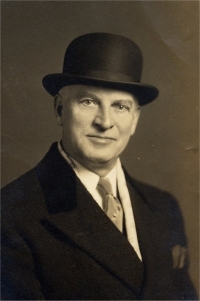 When Cleveland Heights established a Zoning Commission in 1920, Barton R. Deming was one of its first appointed members. Towards the end of his life, Deming lived with his sister, Millie, at 3565 Stoer Road, in Shaker Heights. He served for many years as a trustee of the Cleveland Real Estate Board, and later established the Deming Ironing Company, which manufactured gas electric ironing machines. He died at Overlook House, a Christian Science Home located in Cleveland Heights, on September 15, 1956, at the age of eighty-one. Orth, Samuel Peter, A History of Cleveland Ohio Vol.2, 1910, page 770. The B. R. Deming Company, The Cleveland Leader, advertisement, real estate section, June 1, 1913. Letter dated 5/2/1913, from Clarence E. Terrill, Manager of Abeyton Realty Company to Mr. Charles O. Heydt, Secretary, Rockefeller Archives. Letters from John D. Rockefeller’s Abeyton Realty Company to Grant Deming in 1909, Rockefeller Archives. Bremer, Deanna, Interview with Grant W. Deming, Jr., 2000. Goldberg, Ken, “Temple on the Heights vs. the Rockefellers,” article on www.chuh.net/chhistory/rockefellers.html. Morton, Marian, Cleveland Heights, Ohio: The Making Of An Urban Suburb, 1847–2002, forthcoming, chapter 2. Obituary of B.R. Deming, The Plain Dealer, December 16, 1956.